Hemp seeds can make some people a little nervous. It’s the word “hemp” that does it. Why? Because it comes from the same plant genus as marijuana: Cannabis. But there is a big difference. Where marijuana contains a high amount of the psychoactive substance THC (tetrahydrocannabinol)—the chemical that makes you “high”—hemp plants have virtually none. In fact, there is major benefit in eating hemp seeds: nutrition. Possessing a mild, nutty flavor, hemp seeds are a rich source of plant-based protein and omega-3 fatty acids. 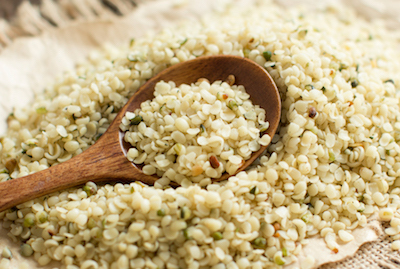 Also called hemp hearts, these seeds of the Cannabis sativa plant are a good source of fiber, magnesium, and zinc, and may be worth including in your diet from time to time. Let’s take a closer look. Three tablespoons of hemp seeds, which is about 30 grams, is 166 calories. Because of their high fat content, they may seem calorically dense, but that includes good fat that promotes heart health and lower levels of inflammation, and plenty of valuable vitamins and nutrients. The 166 calories consist of 15 g of fat, 2.6 g of carbohydrate (nearly half of which is fiber), and 9.5 g of protein. As outlined in the above section, hemp seeds pack a pretty heavy punch when it comes to nutrition. Two of the seeds’ most important and beneficial components are fat and protein. If you’re a vegetarian, you’ll get a much greater amount of high-quality protein from hemp seeds than other popular seeds like chia seeds and flax seeds. For example, while chia and flax seeds only derive about 16% to 18% of total calories from protein, protein makes up 25% of the total calories in hemp seeds. Hemp seeds are also over 30% fat, and a plant source of beneficial omega-3 fatty acids. The magnesium content of hemp seeds is also notable, and is associated with better sleep and heart health, among other benefits. Hemp seeds may provide a boost to heart health, due to the nutrients they carry. Magnesium, for example, plays a role in regulating heart beat and blood pressure. But hemp seeds are also rich in the amino acid arginine, which helps blood move easily through the body by producing nitric oxide. Nitric oxide helps arteries relax and dilate and may lead to a reduced risk for heart attack and heart disease. Arginine intake is also correlated to reduced levels of c-reactive protein (CRP), a major marker of inflammation. Omega-3 fatty acids are also associated with lower inflammation levels. There is some research indicating hemp may help people suffering from skin disorders like eczema. One study in particular showed that hemp seed oil improved fatty acid levels in people with eczema, which is important to managing inflammation and potentially preventing flare-ups. A healthy balance of omega-3 and omega-6 fatty acid levels may regulate immune responses to keep skin conditions from activating. It is also possible that hemp seed oil can reduce itchiness and dry skin when applied topically. You’ve seen that hemp seeds can offer anti-inflammatory effects that can benefit your heart and skin. But they really don’t stop there. The fiber, fat, and other nutrients in hemp seeds may have benefits for a host of inflammatory conditions including arthritis, metabolic syndrome, diabetes, Alzheimer’s, and non-alcoholic fatty liver disease (NAFLD). In addition to being a good source of omega-3 that can help improve the body’s fat balance, hemp seeds are also a strong source of gamma linolenic acid (GLA). GLA is a polyunsaturated fat that is known to have anti-inflammatory effects independently. It should be noted that studies featuring hemp seeds tend to use very high concentrations, and the benefits will be tapered by simply including seeds into your diet. That said, they are still a great source of numerous valuable nutrients! For the most part, including hemp seeds into your diet will be completely safe—as long as they are being used in moderation. Sprinkling them on your salad or putting a few tablespoons into a smoothie is unlikely to have any negative effects. Because of the high fat content, you may notice some mild changes in your stool (more often diarrhea). If you have a sensitive stomach or digestive system, start with a small serving—about a teaspoon—then work your way up to two or three tablespoons if desired. Also, if you’re taking anticoagulant medications to prevent blood clots, talk to your doctor before introducing hemp seeds. Side effects may arise in this group by increasing the risk of bleeding. Also, athletes or other individuals required to submit urine tests should be careful about hemp consumption, as it may lead you to test positive for THC. Aside from packaged hemp goods, hemp seeds can be purchased shelled, ground, or split. If you buy them whole, a pestle and mortar are required to break the hard outer shell. Line a baking sheet with parchment paper and lightly brush the parchment with avocado oil. Pour a ¾ cup of water into a small saucepan, adding the millet and a pinch of salt. Cover and bring to boiling. Reduce heat and simmer until all water is absorbed and the grains appear slightly mushy, roughly 20 minutes. Let cool. Heat one tablespoon of avocado oil in a medium-sized skillet over medium heat. Add the carrots and broccoli to the pan. Add the grated shallots to the pan as well. Add salt and pepper to taste, and stir. Cook until broccoli turns bright green and carrots are soft. Stir in the rosemary, lemon zest, turmeric, and cayenne pepper before taking off the heat to cool slightly. Transfer one cup of the cooled millet to a food processor. Then add in the cooked vegetable mixture, the hemp seeds, psyllium husk powder, nutritional yeast, and grainy mustard. Season with salt and pepper. Lightly oil your hands and measure out two tablespoons of the millet mixture per nugget. Shape into little nuggets and spread out on the parchment-lined baking sheet. Lightly brush the nugget tops with a little more oil. Insert the baking sheet into the oven and bake for 22 minutes, flipping nuggets halfway. They should be a light brown in color and solid enough to pick up. Combine all of the above ingredients in your blender. Blend until smooth, stopping to scrape the sides of the blender if necessary. Cook pasta as per instructions on the package. Combine hemp hearts, lemon juice, water, basil, garlic, vinegar and salt in the bowl of a blender or a food processor and blend until smooth. Scrape down the sides during blending, if necessary. Drain the cooked pasta and rinse with cold water. Return to the pot along with the pesto and stir to thoroughly coat the pasta. Toss in the sundried tomatoes and arugula and blend well. Serve immediately or chill in the refrigerator in an airtight container until ready to serve. If you’re looking to boost your overall nutrition, improve your dietary fat balance, or are seeking a viable source of plant protein, hemp seeds are a useful and versatile way to go. Hemp seeds possess a strong nutritional profile that may offer some positive health benefits for plenty of conditions, and can be acquired easily online and in grocery stores, bulk stores, and health food stores. Ware, M., “What are the health benefits of hemp?” Medical News Today, November 19, 2018; https://www.medicalnewstoday.com/articles/308044.php, last accessed January 29, 2019. Bjarnadottir, A., “6 Evidence-Based Health Benefits of Hemp Seeds,” Healthline, September 11, 2018; https://www.healthline.com/nutrition/6-health-benefits-of-hemp-seeds#section1, last accessed January 29, 2019. “Seeds, hulled, hemp seed,” Nutrition Value, 2019; https://www.nutritionvalue.org/Seeds%2C_hulled%2C_hemp_seed_nutritional_value.html, last accessed January 29, 2019. Chrichton-Stewart, C., “Health benefits of hemp seeds,” Medical News Today, September 11, 2018; https://www.medicalnewstoday.com/articles/323037.php, last accessed January 29, 2019. Laura, “Super Savoury Veggie, Hemp & Millet Nuggets,” The First Mess, June 7, 2017; http://thefirstmess.com/2017/06/07/super-savoury-veggie-hemp-millet-nuggets/, last accessed January 29, 2019. Van Der Kruik, M., “Strawberry, Coconut & Lime Smoothie,” Oh My Veggies, April 17, 2014; https://ohmyveggies.com/strawberry-coconut-lime-smoothie/, last accessed January 29, 2019. Sarah, “Creamy Hemp Pesto Pasta Salad,” Making Thyme for Health, May 16, 2016; http://makingthymeforhealth.com/creamy-hemp-pesto-pasta-salad/, last accessed January 29, 2019.